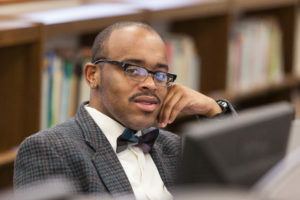 Cleveland Community College provides diverse and accessible learning opportunities to meet the educational and training needs of our community. View the Colleges’ Institutional Effectiveness Plan. CCC wants every student to graduate with a degree, diploma, or certificate; however, we understand that success does not look the same for every student. We believe that a student succeeds when they have the skills necessary to succeed in a highly competitive workforce or academic environment; or, have improved their quality of life through the achievement of personal goals. View the College’s organization chart. On July 1, 1965, the story of Cleveland Community College began. Through the work of the then Shelby Chamber of Commerce and the Cleveland County Board of Commissioners, the Cleveland Unit of Gaston College was established. The unit, led by Dr. James Broughton Petty, began offering classes in the fall of 1965 in two rented buildings on North Morgan Street. 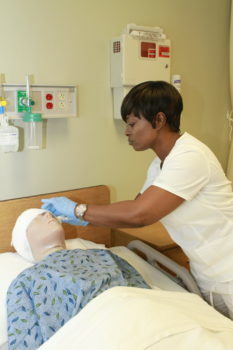 With less than a handful of full-time employees and less than 40 students, the College began operating a few programs, including practical nursing. Just two years after the initial courses were offered, the College became a standalone entity with its own Board of Trustees. Cleveland County Technical Institute was born. With a significant number of veterans taking advantage of the GI Bill, the College began to grow rapidly. The two buildings on North Morgan Street were just not enough to house the number of programs and students. The College administration used every piece of borrowed space with classes being offered in the basements of many Cleveland County churches. In 1969, the College moved to the old “County Home” property owned by Cleveland County located at 137 South Post Road. This location is where the College resides today. In the early 1970s, a long-range building plan was developed. The first two buildings, now known as the Wright Occupational Complex and the B Building, were opened for the fall quarter in 1974. The campus continued to grow significantly in both students and buildings in the 1970s and 1980s. The Jack Hunt Campus Center, which includes the Rose Library and the Keeter Auditorium, and the Student Activities Center greatly changed the face of the campus. The College was renamed Cleveland County Technical College in 1980. In 1987, the College began offering two-year college transfer programs and became Cleveland Community College. Founding president, Dr. Petty, retired as President Emeritus on July 31, 1990. The College’s second president, Dr. L. Steve Thornburg, assumed the presidency on August 1, 1990. Under Dr. Thornburg’s leadership, the College continued to grow in physical plant, programs, and students. In the late 1990s, the College added much-needed classroom and office space (closets had been converted to faculty offices!) with the construction of the Paksoy Technology Center. In 2002, the Brown Emergency Training Center was opened. This facility houses a two-story, residential burn building, rescue tower, space for vehicle extrication training, and classroom space. Home to innovative programs, including the Firefighter Academy, Aircraft Rescue training, Paramedic and EMT training, and training via the flashover simulator, the Brown ETC has the third largest enrollment in fire and rescue training among the 58 North Carolina Community Colleges. Cleveland Community College grew in other areas as well. The College increased its allied health offerings significantly with the addition of the Associate Degree Nursing, Radiography, and Surgical Technology programs. These programs are all housed in the Bailey Allied Health and Science Center along with the Practical Nursing program, one of the two original programs at the College, and state-of-the-art science labs including a biotechnology lab complete with a clean room, donated by the Fullerton Foundation. When the great recession hit Cleveland County in 2008, enrollment at CCC skyrocketed. Almost 4,400 students enrolled in the Spring 2010 semester, breaking all previous enrollment records. Enrollment has leveled off as the economy has improved and more citizens are back to work. The Cleveland Community College Foundation, with the support of the College’s Board of Trustees, entered into an historic partnership with Cleveland County and Cleveland County Schools for the construction of the LeGrand Center. The building provides offices and classroom space for CCC’s Continuing Education programs, Cleveland NCWorks, The Carl and Doris Dedmon Center for Cleveland Early College High School, space for Cleveland County’s economic development efforts, and a conference facility. In 2011, the College was selected as one of only 120 community colleges in the country to apply for the inaugural Aspen Prize for Community College Excellence, ranking it in the top 10 percent of all community colleges in the country. The U.S. Department of Labor Employment Training Administration awarded over $23 million to Cleveland Community College and a consortium of college and university partners for the development of a Mission Critical Operations program in 2013. The grant is the largest ever awarded to a North Carolina Community College. On January 17, 2014, Dr. L. Steve Thornburg was named the Wells Fargo President of the Year by the North Carolina State Board of Community Colleges. In 2017 Dr. Thornburg retired, after more than 27 years of service to the College. Dr. William C. Aiken served as interim president until Dr. Jason Hurst was chosen as the third president of Cleveland Community College. Dr. Hurst assumed the presidency on April 1, 2018. For more than 50 years the College has met students where they are whether they need to finish a high school degree, transfer to a four-year school, earn a degree, diploma or certificate, learn a trade, or build on career skills they already have, and helped them achieve their goals and go as far as they can in life. CCC exists to serve the citizens of Cleveland County. We want to help you achieve your educational and career goals. If you are a high school student who is anxious to get a job after graduation, we want to help. If you are a high school student who wants to earn credits toward a bachelor’s degree and transfer to a four-year school, we want to help. If you are someone who has been working for a few years or many years, and want to take a few classes to gain new or updated skills, we want to help you too. We believe in letting you do Education Your Way, but that doesn’t mean you have to do it alone. In the normal operation of the College, data is collected on the internal and external environments of the institution. The appropriate staff analyzes the data collected on an ongoing basis and conducts research projects as needed to supplement the information needs of the institution. The Director of Reporting and Data Collection assists the Dean of Planning and Institutional Effectiveness in coordination of data collection, retrieval, and distribution and assists in the development of research projects. The College’s research activities incorporate requirements of accrediting and governing agencies. When a member of the College faculty or staff needs to survey students, employees, or its constituents, the survey must be prepared in cooperation with Planning and Institutional Effectiveness. This process is to be used only when conducting normal College business. Complete the CCC Employee Survey Request Form located on the employee Intranet. Send form to the Dean of Planning and Institutional Effectiveness with a copy of the survey questions. The Dean of Planning and Institutional Effectiveness will create the survey and provide a copy to the author for editing. The edited survey will be forwarded to the appropriate Vice President for approval. Research to be conducted outside the scope of normal College business must be approved prior to contacting any proposed participants. This includes, but is not limited to, all surveys, interviews, focus groups, or data mining that is part of a class, a requirement to earn a degree, or due to other outside interests. Complete the CCC Research Proposal Form, located on the employee Intranet and the Internet, and submit it along with a copy of the class assignment or proposal to the Dean of Planning and Institutional Effectiveness. The Dean of Planning and Institutional Effectiveness will complete the Recommendation to Administration and forward all material to the President’s Cabinet. The President’s Cabinet will make the final decision concerning approval. The Dean of Planning and Institutional Effectiveness will contact the investigator with a final decision. Planning Council approved February 2, 2015.